It's time for another edition of the All About Dog Training blog carnival. I realize that the carnival was supposed to happen yesterday, but for some reason I hadn't received any submissions. Then I suddenly remembered that the submissions were sent to a different e-mail address, one that I hadn't set up on my PC after the laptop broke down. Anywho - when I finally set up the right e-mail address, there were all of these great submissions waiting for me. So, my apologies for the delay - and on with the all about dog training blog carnival! So let's start the carnival with a bang - a must-read by Lee Charles Kelley about the "scientific" underpinnings of the major modern schools of dog training entitled Of Philosophers and Flatworms (subtitled It’s In His Blood, It’s In His Heart). If you've ever been interested in how "positive reinforcement" got its start, some thoughts about why it works (when it works) and why it doesn't (when it doesn't) - then this is a great place to start. Sure to provoke some of your own thoughts, comments, and curiosity about the topic. On a more mundane (but essential) topic, Cindy S discusses How to Housetrain Your Puppy. Cindy points out some sure-fire signs that your dog is about to GO. Note that while she suggests a crate that is big enough to allow for a dog to have a bed and go to the bathroom, I personally find that to be a less effective technique - since you are, in effect, encouraging a dog to do its business inside. My preference is to use a smaller crate so as to discourage ANY in-house messes, and, if you can't get away on your lunch break to let your dog out, hire a dog walker to let your puppy outside for you. On the other hand, she also addresses the topic of housebreaking pads, for people who WANT their dogs to do the deed indoors (in a prescribed area). Whatever floats your boat! Just remember that creating a routine for your dog is also important - i.e. always take them out before you put them in the crate, and always take them outside immediately after letting them out of the crate. 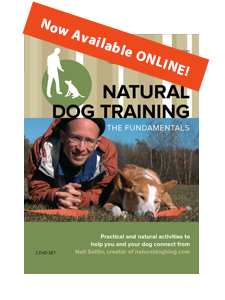 Here is an article where we talk about Crate Training here on the Natural Dog Training blog. Shifting gears yet again, we have an article from Lexi Sundell on using something called "Crystalline Consciousness Technique" to regulate the energy fields in a room, in order to help quiet a rambunctious puppy. 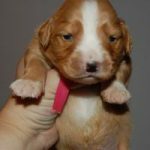 While I can't vouch for the technique (although I see on her site that she offers a free mini-session), we have discussed frequently here on the NaturalDogBlog how your intentions/emotional state affect what is going on with your dog. There are some great prey-related exercises that I'd recommend for Lexi with her pup - but it sounds like a little energy field manipulation is going a long way for Lexi and her husband. An interesting read - and let me know how it goes if you try the free mini-session. For those of you wondering How To Choose Music in Canine Freestyle, check out a few tips from Annette over at AgilityNut. I always thought Nola liked the Violent Femmes, but it turns out that it was just wishful thinking. She really digs Vivaldi, which makes for a really interesting freestyle session. So did the Violent Femmes, of course. Finally, here's a random clip submitted by Adam - with footage of a jack russell terrier who's really into Xtreme Sports. If you've ever wondered what it'd be like to see a dog on a surfboard - here's your chance! The clip is about 4 minutes long - great for when you're looking for a break from all those political blogs you read. OK - one last - some advice for those of you who are contemplating using your dog training skills to help a prisoner escape from jail - you might get a honeymoon fling, but you'll probably end up back in the slammer with your newfound love. Follow your heart before it leads you astray, ok? We appreciate the warning, therapydoc. Thanks to all who participated in the fifth edition of the All About Dog Training blog carnival. We'll resume our regularly scheduled programming soon, with a follow-up to our post on answering your dog's second most important question: Where's the Danger? Hope you're all having a great week. This is a great bunch of posts. I once really considered chucking people and moving into animal psychology. Just couldn't bring myself to do it. Just wanted you to know that I just finished adding some new material to my blog entry. It's now subtitled, "It's In His Blood, It's In His Heart." Thanks for the update - editing to reflect the new subtitle.